1) This paper is an invited paper presented at the FIG Congress 2010 in Sydney, Australia, 11-16 April 2010, This paper is written by Dr. Clarissa Augustinus from UN-HABITAT, with whom FIG has had an outstanding cooperation for many years. Therefore - in addition of being an excellent presentation on social tenure domain model - this paper also recognises the long-term cooperation between UN-HABITAT and FIG. Clarissa Augustinus is a social scientist who has had large impact in the land surveying world. Handouts of this presentation as a .pdf-file. Most developing countries have less than 30 percent cadastral coverage. This means that over 70 percent of the land in many countries is generally outside the land register. This has caused enormous problems for example in cities, where over one billion people live in slums without proper water, sanitation, community facilities, security of tenure or quality of life. This has also caused problems for countries in regard to food security and rural land management issues. The Global Land Tool Network (GLTN), a coalition of international partners, including FIG, has taken up this challenge and is supporting the development of pro poor land management tools, to address the technical gaps associated with unregistered land, the upgrading of slums and rural land management, among other things. The security of tenure of people in these areas relies on other forms of tenure, not individual freehold. Most rights and claims off register are based on social tenures. GLTN partners support a continuum of land rights, which includes rights that are documented, undocumented, individual and group, pastoralist, slums, legal, illegal and informal. This range of rights generally cannot be described relative to a parcel, and therefore new forms of spatial units and a domain model has been developed to accommodate these social tenures, termed the Social Tenure Domain Model (STDM) (Augustinus, Lemmen and van Oosterom: 2006). This is a pro poor land information management system which can be used to support the land systems of the poor in urban and rural areas, but which can also be linked to the cadastral system so that all information can be held on one system. This approach will open up new markets to the land industry and it will also be an opportunity to develop new skills and improve management skills. STDM could make it possible for all citizens to be covered by some form of land administration system, including the poor, thereby improving the land management capacity of the industry, as well as addressing upcoming challenges such as climate change. Also, STDM should contribute to poverty reduction, as the land rights and claims of the poor are brought into the formal system over time. It will improve their security of tenure, increase conflict resolution, limit forced evictions, and help the poor to engage with the land industry in undertaking land management such as city wide slum upgrading or rural land management. The pro poor land management approaches under development by GLTN partners is a new way of doing business and is key to solutions for the challenges of today and tomorrow. GLTN is focusing on filling the gap by building the technical and governance solutions and the capacity for the industry to use them. The technical gap covered by STDM is in the critical path of the delivery of a number of the Millennium Development Goals namely, Goal 1 on food security, Goal 3 on the promotion of gender equality and the empowerment of women, and Goal 7 on ensuring environmental sustainability, including improving the lives of slum dwellers. There are now more people living in urban areas than in rural areas and of the total urban population of 2.3 billion in 2005 at least 810 or 39 percent live in slums (Moreno: N.D). Most people living in slums do not have registered land rights. This means that there is no cadastre in these areas or it does not match the de facto land tenure situation. Cadastres do not just deliver security of tenure. As Williamson, Enemark, Wallace and Rajabifard (2009) argue, cadastres also deliver a land administration system. It is this system that makes the cadastre invaluable for other purposes, such as planning, service delivery, environmental management, city management, cost recovery, land tax, and land management, such as slum upgrading. In developing countries cadastral coverage is often less than 30 percent of the country (Lemmen, Augustinus, Haile and van Oosterom: 2009). This means that about seventy percent of the land in many countries is outside of the freehold parcel based land administration system and its land information system. This implies that people living in these areas are often at a disadvantage, not just in regard to security of tenure, but also in regard to such things service delivery and land management approaches. The people in the seventy percent generally use a wide variety of social tenures to secure their land rights and claims. These tenures include documented, undocumented, individual and group, legal, illegal and informal and over-lapping rights and claims, such as those of slum dwellers, pastoralists, women whose rights are often nested in family rights, rights of groups, and multiple over-lapping claims in post conflict areas. This range of tenures cannot be easily captured on conventional cadastral and land administration systems because they are not based on unique parcel based polygons, which are also legal evidence of land rights. The Global Land Tool Network, a coalition of international partners, has been promoting the idea that firstly, the variety of rights and claims in land should be seen as a continuum of land rights which can be incrementally upgraded over time, beginning with weak rights based on political support, right up to full freehold, with steps in between for informal and formal rental agreements/leases, migration routes, claims on post conflict property and so. There will be different continuums in different countries and different contexts. Across a continuum different tenure systems may operate, and sites in a settlement may change status over time. (UN-HABITAT: 2008). Secondly, the continuum of land rights requires a new type of land information management system and land administration system. This is required to implement the continuum of land rights and claims and systematise them also for the purpose of land management. The Social Tenure Domain Model (STDM) (Augustinus, Lemmen, van Oosterom: 2006) was designed to fill this technical gap. This technical gap was identified as early as 1998 (UNECA: 1998). First a number of land tenure policy specialists working in Africa, Asia and South America identified the fact that there were a range of social tenures that could not fit with conventional land registration systems, in terms of the types of rights held, and/or the spatial description of the rights, and/or the land title conditions. These policy specialists came to prominence in the 1980s and 1990s with the result that there was little support for the use of conventional titling for customary areas for example (Dorner: 1992; Bruce and Migot-Adholla: 1993; Migot-Adholla, Hazell, Blarel and Place: 1991). By the end of the 1990s and the beginning of 2000, a number of people working in the land administration field also became convinced that conventional land administration systems were not always appropriate for the range of tenure types that exist such as customary areas, pastoralists and for slums (UNECA: 1998; Barry and Fourie: 2002; Fourie, van der Molen and Groot: 2002). Taking this further, it became clear over time that the 70 percent of the areas outside the land registry in many developing countries, which areas had no land administration system and land information management system, generally meant that land management could not be undertaken in these areas. It also became clearer over time that this impacted a wider range of issues aside from security of tenure for the lower income groups. That is, this gap was contributing directly to chaotic and unsustainable cities, problems around land degradation and water shed management, deforestation, the inability to solve land in many post conflict environments, chaotic traffic and a proliferation of slums. Lemmen took the lead on trying to develop solutions to fill this technical gap from 2002 onwards, by starting to develop the Social Tenure Domain Model (STDM) at the conceptual level (Augustinus, Lemmen, and van Oosterom: 2006). ITC was then financially supported by the Global Land Tool Network (GLTN) to develop the technical aspects of STDM. GLTN is facilitated by UN-HABITAT and funded by Norway and Sweden, which are GLTN partners. The technical development of STDM has been undertaken with the encouragement of the President of International Federation of Surveyors, Stig Enemark, who also committed FIG to working towards filling this technical gap by supporting research around STDM. The Global Land Tool Network (GLTN) is a coalition of international organisations who have agreed on an agenda of 18 pro poor land management tools for urban and rural areas (www.gltn.net). Most tools are national but have rural and urban applications. These tools are being developed by the partners not just as tools on their own, but also linked to cross cutting issues such as gender, the involvement of the poor users, land governance, and the need for capacity building. The continuum of land rights (which is about the incremental acquisition of rights over time), and STDM are two of the GLTN tools. The partners working on STDM include UN-HABITAT, FIG, and the World Bank and ITC, which has been at the forefront of developing STDM. Other GLTN partners from the land administration industry in GLTN include FAO, the Commonwealth Association of Surveying and Land Economy, Federation des Geometres Francophone and the Royal Institution of Chartered Surveyors. There are also other types of partners, such as from international civil society and research and training institutions. I will argue that by filling this technical gap, through such tools as STDM, land managers, land administrators and land surveyors will have an increased market share. Also they will be able to position themselves centre stage in solving the problems of today, whether it be in regard to climate change, or the creation of sustainable cities and the prevention of slum growth, or ensuring food security for nations. They will be able to do this because they will have a greater range of options, tools and solutions to offer policy makers and politicians on how to address the issues of the 21st century. Also, STDM could enable professionals to deliver services to all citizens, thus addressing the critical issue of equality and justice and thus contributing to stable cities, and respect for the law. The paper will also describe how the poor can benefit from STDM, through improved security of tenure, more services, increased conflict management and more predictability in their lives, including being able to leave their land to their children when they die, a critical issue for poor people. All of these will contribute to poverty reduction and decrease the impact of human settlement related shocks, such as forced evictions, on the vulnerable, such as women and the poorest of the poor. The conclusions of the paper is that the land industry has a technical gap in their tools and using current approaches cannot deliver robust security of tenure, land information management, land administration systems or land management at scale, particularly in regard to developing countries, both in the rural and urban areas. This gap is affecting the sustainability of the planet and its cities, forests and food production among other things. The industry has taken up this challenge but still more needs to be done and done more quickly. Half of humanity now lives in cities, and by 2050 70 per cent of the world’s people will reside in urban areas. By the middle of the 21st century the total urban population of the developing world will more than double, increasing from 2.3 billion in 2005 to 5.3 billion in 2050. “Urban growth rates are highest in the developing world ..(which is) responsible for 95 per cent of the world’s urban population growth” (UN-HABITAT: 2008). However, many cities will be characterized by urban poverty and inequality, and urban growth will become virtually synonymous with slum formation. Indeed, Asia is already home to more than half of the world’s slum population (581 million), followed by sub-Saharan Africa (199 million), where 90% of new urban settlements are taking the form of slums. 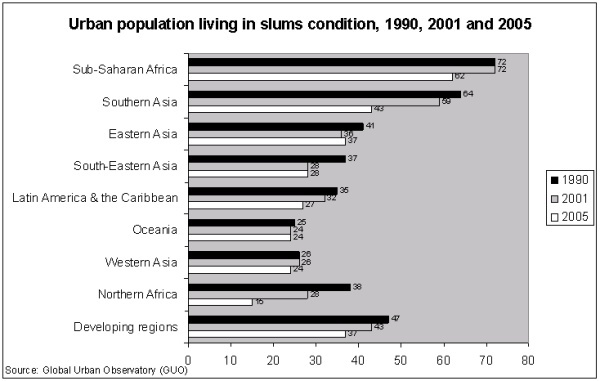 As shown in figure 1 (below), at least one third of the urban population in the developing world lives in slum conditions. Figure 1: Estimated urban population living in slum condition between 1990 and 2001 2. Moreno: (N.D). 2.The drastic reduction of the percentage of urban population living in slums, particularly in Sub-Saharan Africa between 2001 (72 per cent) and 2005 (62 per cent) is largely explained by the change in slum definition which now includes the use of pit latrines. A slum household is defined as a group of individuals living under the same roof lacking one or more of the following conditions: access to improved water; access to improved sanitation facilities; sufficient living area (not more than three people sharing the same room); structural quality and durability of dwellings; and security of tenure (UN-HABITAT: 2008). From another angle, the space taken up by urban localities is increasing faster than the urban population itself. Between 2000 and 2030, the world’s urban population is expected to increase by 72 per cent, while the built-up areas of cities of 100,000 people or more could increase by 175 per cent. The land area occupied by cities is not in itself large, considering that it contains half the world’s population. Recent estimates, based on satellite imagery, indicate that all urban sites (including green as well as built-up areas) cover only 2.8 per cent of the earth’s land area. This means that about 3.3 billion people occupy an area less than half the size of Australia (Angel et al, 2005 cited by UNFPA, 2007). Over the next 25 years, over 2 billion people will be added to the growing demand for housing, water supply, sanitation and other urban infrastructure and services. What is critical when considering this number is the order of magnitude. Close to 3 billion people, or about 40% of the world’s population by 2030, will need housing and basic infrastructure and services. But as I will argue, the land industry does not have all the technical tools and solutions needed to meet this challenge and new ways of doing business and a range of new pro poor land management tools need to be developed to meet this challenge. The Social Tenure Domain Model is an attempt to fill one of these technical gaps. Finally, the Millennium Development Goal 7, Target 11, commits the international community to achieving a significant improvement in the lives of at least 100 million slum dwellers by the year 2020. The attainment of even this very limited goal is not promising. Reporting on the attainment of Goal 7, the United Nations (2007) stated that “(i)n 2005, one out of three urban dwellers was living in slum conditions – that is lacking at least one of the basic conditions of decent housing: adequate sanitation, improved water supply, durable housing or adequate living space.” UN-HABITAT states that few countries are on track for reaching Goal 7, which would imply a rapid and sustained decline in slums. Countries that are the furthest from the slum target goals are mostly in Sub Saharan Africa (2006). The Social Tenure Domain Model (STDM) is a key tool which could deliver this target and the reasons for this are described below. It should also be noted that the technical gap covered by STDM is in the critical path of the delivery of other Millennium Development Goals namely, Goal 1 on food security and Goal 3 on the promotion of gender equality and the empowerment of women. Moving away from individual freehold parcel based tenure systems and adopting a range of rights and claims in order to extend security of tenure to more people, including the poor, implies that a new form of land administration has to be designed. Adopting a continuum of land rights made the land administration technical gap obvious, which technical gap is covered by STDM. The continuum of tenure types is a range of possible forms of tenure which can be considered as a continuum. Each continuum provides different sets of rights and degrees of security and responsibility. Each enables different degrees of enforcement. Across a continuum, different tenure systems may operate, and plots or dwellings within a settlement may change in status, for instance if informal settlers are granted titles or leases. Informal and customary tenure systems may retain a sense of legitimacy after being replaced officially by statutory systems, particularly where new systems and laws prove slow to respond to increased or changing needs. Under these circumstances, and where official mechanisms deny the poor legal access to land, people tend to opt for informal and/or customary arrangements to access land in areas that would otherwise be unaffordable or not available (UN-HABITAT:2008). Drawn from Fourie and Nino Fluck (2001) it is clear that the different types of tenures found in the continuum pose a challenge to conventional land administration systems as they are not generally parcel based. Parcels have been the basic unit of data collection and the linking mechanism to other information in a database. This has meant that most information about the land in developing countries could not be utilized in Land Information Management (LIM) systems, as the information is generally not parcel/polygon based, let alone cadastral parcel based. Customary land, including in urban areas, is conventionally not parceled (Latu:N.D). Often the boundaries of the informal settlers’ properties do not accord with the cadastral layout, and this can vary across the settlement and between settlements (Jenkins et.al.:1986). Once it was recognized that freehold parcel based tenures could not go to scale and that to supply security of tenure at scale we would have to adopt the continuum of land rights, it became inevitable that we would have to re-think our land administration systems, also in regard to identifiers. This in turn would mean that we would need a new land information management system that could handle such a range of identifiers. Lemmen’s design of STDM has done this and gone even further. “STDM.. is intended to provide a land information management framework that would integrate formal, informal, and customary land systems, as well as integrate administrative and spatial components.” This is “..possible through tools that facilitate recording all forms of land rights, all types of rights holders and all kinds of land and property objects / spatial units regardless of the level of formality.” (Lemmen, Augustinus, Haile, van Oosterom: 2009). To conclude, once the off register social tenure arrangements of people, particularly the poor was recognized, this meant that new technical challenges emerged for the land industry. It is only be by addressing these challenges that it will be possible to meet the needs of the poor and deliver sustainable land management for the planet. In meeting this challenge the industry will also be able to extend its markets and position itself even better with policy makers. By developing tools such as STDM to fill this technical gap, the land industry will be able to go to scale and cover the whole of any country, including the areas that are not currently covered by the cadastre, thereby extending their markets and delivering services to all segments of the population. This in turn will improve the professionalism with which the land industry serves its clients. It will also make land markets more efficient and improve our ability to address the land management challenges of the 21st century. In developing countries often the coverage of the Surveyor General and Registry land records is less than 30 percent of the country (Lemmen, Augustinus, Haile and van Oosterom: 2009). This means that 70 percent and more of the country is outside of the freehold based land administration system and its cadastral land information system. This in turn means that land management in these areas is very difficult. Sub Saharan Africa and slum areas are examples of this and are well known to be data poor, which in turn creates problems for land managers undertaking city wide management and slum upgrading for example. STDM could fill that data gap and make it possible to go to scale also by including the low income areas. This would mean that more practical policy for the whole city could be developed and implemented. This would be possibly for a range of reasons. Firstly, currently countries and local governments are limited in their ability to go to scale in terms of land records and land management. The development of STDM data, based on the continuum of rights tenures, would be critical for them to be able to cover their jurisdictions systematically, so that all citizens would have some sort of access to land and security of tenure. Local governments and their land officials have a key role in driving land management, land use and resource allocation and sustainable development. They have been hampered in their job by not having sufficient data, as they are generally reliant on the national, or federal, system to produce land parcels to which they can link their attributes. STDM could make it possible for these land officials to fill the data gap and assist their local authorities to fulfil their functions better, as well as improve their ability to deliver for all the citizens of the city, including the poor. This could be done also because existing data sets could be over laid with STDM data in a way that could increase the knowledge of policy makers and planners. This would be particularly appropriate for environmental management, both of natural resources and the built environment, as well as the design of sustainable land use patterns. Looking to the future, STDM could be critical for local authorities to be able to manage the effects of climate change. Secondly, through the introduction of STDM, low income communities will incrementally become used to land information systems, and some of the legal issues surrounding land. This capacity building is critical for maintaining currency in any system, and will be of great use once these people move into more legal systems, where land records often lose currency because users do not see the value of updating them. Once STDM information is available for any particular low income community it will make it quicker and more efficient to plan the area, to upgrade it, deliver trunk infrastructure and affordable services. It will be quicker and more efficient because the data needed to do the initial planning will already exist; and some capacity will already exist in the community in regard to land and land information, making it easier to negotiate with the community in regard to land readjustment, upgrading and/or land acquisition and compensation. This will also make it safer in some areas for surveyors to undertake surveys. This efficiency in turn should make it possible for the land industry to scale up their role in city management and improve their unit costs. Re-tooling costs could be offset quicker through these efficiency gains. Thirdly, STDM would make it possible to link information to other mapping agencies and data providers which are not currently able, or willing, to use cadastral data because of its high accuracy requirement and/or more importantly, shortfalls in coverage. This again could improve the scale of service delivery and land management. Fourthly, by systematising information, including rights (formal, informal and customary), claims, over-lapping rights and claims and disputes, oral and written contracts, STDM could make an important contribution to bringing peace in post conflict countries where land has been a key driver of conflict. The role of STDM in post conflict areas has already been identified as a need, and this is a critical new market for the land industry. Generally land disputes are not addressed systemically, or in time, in these situations because of this technical gap, and STDM would also enable land dispute resolution to be scaled up, thereby directly contributing to peace building. Finally, STDM could generate data so a country could better measure its coverage in regard to security of tenure. Currently indicators on security of tenure are limited by a lack of reliable data. It would also improve the ability of the land industry to make cross country comparisons. The failure of current conventional systems to deliver at the necessary scale, because of the technical gap covered by STDM, has left land professionals in a weaker position than they should be in regard to policy makers. STDM, by addressing a technical gap and giving new options, tools and solutions will make it possible for land professionals to increase their ability to influence decision makers. People who can assist policy makers to address the problems of chaotic and unstable cities, impossible traffic problems, land conflict, and climate change issues, are the leaders of the future. Also, STDM could improve the symmetry in land information in general which has the potential to decrease corrupt practices found in some of the land agencies and among some land professionals. This could improve the image of the land industry as a whole in those countries. From another angle, STDM could increase the market of the land industry by incorporating all sorts of transactions over the continuum of land rights, not just freehold. It has been hard for the industry to engage with the low income part of the market also because of the lack of affordable pro poor land tools, particularly the documenting of social tenures and information management systems. Market share could also be increased through the development of a wider range of services. STDM data could be used like cadastral data for business processes, such as developers undertaking slum upgrading, commercial concerns delivering to the informal economic sector of bread, alcohol, dry cleaning and so on. In regard to this, STDM data will include a range of types of data including dirty data, legal and informal data. The land industry will need to adjust to this range of data, and how to use it as over laid data, in order to improve land use planning, land management and environmental planning. Non specialised people will also produce some of the data. New skills will be needed in interpretation of the data and the management of the results. New skills will also be needed to manage a different level of data gatherers. Some types of risk will decrease and other risks will emerge, and these will have to be managed. A new type of land information manager and land manager is likely to emerge to use STDM, which will need capacity building and resources. A specific example of these potential new roles and opportunities relates to land and the courts. Many countries in the world have huge case back logs of land cases, or cases which have underlying issues related to land. STDM can identify and describe the range of land disputes that exist, and at an earlier stage prior to entering court, thereby decreasing the number of cases in court and increasing the number of cases that could be solved through Alternative Dispute Resolution mechanisms. This has always been a crucial role of surveyors and may strengthen the role and scope of community leaders, para-legals, government officials, surveyors and lawyers involved in mediation. Finally, the ability of the land industry to deliver to all citizens, including the poor, and not just the rich, middle class and commercial classes as is the case currently in many countries, could in time improve the equality and social justice that is often missing in the land sector. Until the technical gap currently covered by STDM is filled, this issue will continue to block the attainment of the goal of land reform. By using STDM the land markets should operate more efficiently as well. This efficiency will come about for a number of reasons. Firstly there will be more symmetry about land information to all stakeholders, increasing transparency for buyers. Secondly, both the formal and informal land markets will be able to be placed on the same land information system, as the STDM can also be linked to the cadastral information system, improving symmetry of information even more. Thirdly, because of the availability of STDM data it will be easier for negotiations to take place on land that has been frozen by family and neighbourhood disputes and/or deceased estates. This will be of particular importance in Muslim countries where shared inheritance is practiced. Fourthly, land acquisition for development will be easier because data will be available from the outset, hopefully linked to pro poor compensation packages. This is particularly important in peri-urban areas where urban development is often concentrated, yet land records reflecting the legal reality are often the weakest. Fifthly, because of data availability, land use planning will be more efficient and realistic and hopefully affordable. Sixthly, one of the major delays in land documentation (registration) is adjudication. STDM data will make systematic adjudication more efficient as it could build on existing data and potential disputes can be identified before hand. Seventhly, land disputes and the type of dispute will be known to all buyers, who will be able to factor this into value and price. Eighthly, through the STDM system which supports a range of rights and not just freehold, buyers will be able to better assess the security of tenure of different documents and the value of the land will more accurately reflect the land market. Ninthly, land use conflicts will be able to be identified at an earlier stage and dealt with, with the result that there could be less land related court cases. Court cases can freeze land for years, so STDM may well free up this land earlier. Also, since STDM will provide more realistic information which will be reflected in the land value, the market will indirectly influence quicker resolution of land disputes. Tenthly, by expanding the conventional systems and formal markets to link to STDM, the other forms of tenure, and the informal markets, the supply and demand currently focused on freehold, which causes economic distortions and increases corruption, is likely to be re-set at a new position. All this will improve the functionality of the land markets. Finally, surveyors and information managers will have to manage the transition of the land and data, including STDM data, through different stages of the continuum of land rights in a way that “..anticipates the complexities of a fully developed formal land market.” (Williamson, Enemark, Wallace, Rajabifard: 2009). Currently, most poor people are not covered by a land administration system and its linked land information management system. This means that they do not benefit from these systems in regard to tenure security, planning and service delivery, slum upgrading, resolution of disputes and so on. STDM would make it possible for a country and/or local government to go to scale and include low income people in their information systems and in their land delivery approaches. This would have a direct impact on the quality of life of the poor and on poverty reduction. It would also have a direct impact on the stabilisation and governance of cities, also through the empowerment of the poor. This is because it is not possible to create sustainable cities if the poor are not part of the solution. STDM will be used to document land rights, claims and over-lapping rights prior to conventional adjudication, planning, surveying and registration, which is expensive, takes a lot of time and normally is out of the reach of the poor. Also the STDM information will include both de facto as well as de jure land ‘rights’ and use rights on the same system. The availability of data and on the same system will mean two things. Firstly, this will enable more effective, efficient and affordable city wide land use planning, which has often suffered from data deficiencies. This will make it possible to service slum areas more easily and link it to the trunk infrastructure, also because it will give the poor an address, making it possible to undertake cost recovery on services. This will increase service delivery to the poor, such as water. Secondly, a major cost and time issue related to land registration is the information produced during adjudication in formal land titling processes. The STDM data will make adjudication, surveying and documentation at some later point cheaper, more efficient and faster thus making it possible for the poor to be brought into the formal systems earlier, thereby increasing their security of tenure along the continuum of land rights faster. The STDM will hold information on the rights and claims of the poor and the information from the cadastre, state asset register, and municipal asset register (where this information is available). Knowledge of the legal status of the land will limit evictions. A common problem has been that state officials allocate land to investors and developers which is already occupied by the poor, because there is no information about land rights on their land information system. By linking the cadastral information to STDM information it will be possible to ascertain whether the land is already occupied and claimed and is not empty. Mozambique has used this kind of approach effectively. Also, the poor will be able to identify the legal owner of the land they occupy with whom they can negotiate. Renters in the slum could be protected during this process as their information will also be identified on the STDM -their rights and claims as well as that of the ‘owners’ would be identified. NGOs in the Philippines have used this kind of approach to effectively negotiate with land owners. An operating STDM could also make it possible for the poor to argue for compensation when land acquisition is undertaken, and help to standardise compensation procedures, as they could be based on STDM information. From another angle, slum upgrading currently tends to be project or community focused because of a lack of city wide land information and land management. An STDM type tool is in the critical path of city wide slum upgrading and the provision of planning and service provision to the poor at scale. City wide land management will be possible once the entire city is covered with conventional cadastral information management system linked to the STDM information, as the information will be at scale. Not only will it be possible to work out more affordable and efficient options, but it will also be possible to implement the policies better. It will be possible to carry out improved policy planning and implementation for the city in general, as well as road, trunk infrastructure, services and community facilities, as well as environmental management. This is turn will impact the lives of the poor through for example, improved transportation (the poor often spend hours commuting); cheaper water supply (the poor pay more than the rich generally for water); more accessible health facilities (the poor often have to travel hours to get medical attention and are more reliant on hospitals as the rich tend to use private doctors). Finally, a key issue for the poor is whether their children can inherit the land they are holding. STDM could make it easier for the poor, particularly women, to inherit the land as it could provide the necessary information for the resolution of disputes, as well as supply some evidence of rights and claims which could under the right conditions enable forums, such as courts, to make better and less arbitrary decisions. People who do not have access to basic services, who do not have security of tenure and who constantly experience the threat and fear of losing their homes need improved quality of life. This is the case for many inhabitants of the slums. Their quality of life is directly related to secure access to land which is serviced. STDM can contribute to poverty alleviation through improving poor people’s access to a key asset for sustainable livelihoods, namely access to land and security of tenure. Also, through creating a system to underpin affordable land tenure options, it can reduce the cost of access, planning and servicing of the area, thereby putting more money in the pockets of the poor. STDM can contribute directly to slum dwellers’ quality of life through improved service provision because it will make it possible to create a large scale detailed map of the entire jurisdiction, be it a local authority, area of a para-statal responsibility for water or electricity, or under the responsibility of a national department, such as education. This could mean that slum dwellers, who have often been excluded from service delivery, could be able to more easily receive services including community facilities. Often slums cannot be serviced with water, refuse clearing, electricity, schools, clinics because the slum area is not on the ‘official map’ of any of the line departments responsible for education or health for example, or even the local government responsible for refuse, electricity etc. For example in Kenya, the Department of Education does not address schooling in slum areas as they are in unplanned areas, and informal schools are the only option for young slum residents. With STDM data and on one system, it could be possible to undertake planning, service delivery and the delivery of community facilities. This would have an enormous impact on the quality of life of the slum residents. Also, increased security of tenure means that people invest more in their homes. The quality of the housing stock in the slums is likely to improve, which will impact residents quality of life. People will most likely replace leaking roofs, mud walls which cave in to overflow streams and poorly built pit latrines once they have a form of security of tenure. This will contribute directly to their quality of life. From another angle, poor people generally rely on neighbours to see them through hard times. When slum residents are evicted they not only lose their land and homes, but they also lose their networks. This means that they become more vulnerable to shocks, such as natural disasters, loss of employment during economic down turns, or the loss of the bread winner to HIV/Aids and other diseases. These shocks are known to force people into becoming the poorest of the poor where it is difficult to survive. Because STDM assists poor people’s security of tenure prior to all the formal procedures, it may be possible for people to remain resident within the same neighbourhood for longer time periods, thereby keeping their safety nets in place and limiting the impact of shocks on the poor and vulnerable. Finally, the more information the poor have about the land they live on, the more they will be able to plan, instead of surviving day to day never knowing when they are going to be evicted. STDM can supply that kind of information to make it possible for the poor to better plan their lives. Information is power. STDM can make information available at a lower level in a more simple fashion, such as on land tenures, so that poor people can both access it and understand it. This should improve transparency about land allocation, acquisition, inheritance and transfers -for example from government to private developers. The poor may not be as much at the mercy of the syndicates which sometimes operate in the public and private sectors. This can contribute to decreasing evictions and limiting corrupt practices. STDM and the land documents linked to it can increase democracy by building capacity in the poor, in terms of knowledge transfer about the wider land setting, and empower them to negotiate better with other stakeholders, such as private land owners and local authorities. Increased negotiation capacity by the poor with other stakeholders should mean that it could be possible to undertake more sustainable planning and land management, such as land readjustment, as the poor take ownership and responsibility for their settlements. Many women are disproportionally affected by poverty, and this is directly linked to their access to land. On average women have fewer rights over land than men, and poor women particularly suffer from this problem. The experience of the Huariou Commission and Slum Dwellers International, both partners in GLTN, have shown that women play a key role in successful slum upgrading exercises. STDM can contribute to overcoming gender disparity as it can also hold the record of women’s land rights, which are often nested within family rights, thereby empowering them to claim these rights and participate in land management operations. Land and conflict are often linked, and STDM can contribute to improved land governance as STDM information can be used for dispute resolution between neighbours, between residents and the state, and residents and local authorities, as it could show rights, claims, and over-lapping rights and claims. Having such information and at scale may also make it possible to develop typologies of conflict and create procedures around their resolution. For example, disputes between neighbours over boundaries can probably be solved locally by community leaders with sufficient information and power. Disputes between communities and private land owners will need to be solved through other means. That is, STDM can be crucial to a process whereby land disputes can be recorded and fed into a dispute resolution process. In this way STDM can contribute to conflict management in cities, which will in turn have an impact on violence and crime in cities, as often this is linked to land. That is, STDM could contribute to social stability. This together with improved governance and respect for the rights of all citizens in the city, as well as tools which the poor can use to document their land, can build the rule of law. Too often the regulatory framework associated with land has been damaged and distorted. STDM can make it possible to strengthen the rule of law around land. Finally, STDM can make full coverage of both the rich and the poor land rights and claims possible, and place the information on the same system. This would facilitate the better allocation of resources and the redistribution of land and use rights for improved sustainable development. The urban challenge is enormous. Cities are already struggling to cope with the impact of urbanization and this is set to increase in many countries, especially in Africa and South East Asia. Managing the expected increase in the geographic area of cities will require large scale investment to ensure that urban development is not chaotic. The amount of shelter and land delivery needed over the next few decades, to ensure that there is adequate housing for all, and for the world to move to sustainable urbanization, is daunting. Yet a review of the global position in regard to shelter delivery indicates that the agenda is not prominent enough and urgent action is needed to get a focus back on this sector. While, through the work of GLTN partners and others, the implementation of pro poor large scale land tools has started, much more needs to be done to go to scale. The conclusion of the paper is that there is a major technical gap which needs to be filled and this has been shown relative to the urban areas. (Rural examples could have been used for the same purpose as GLTN and STDM are designed to serve national needs -rural and urban). Using current approaches cannot deliver robust security of tenure, land information management, land administration systems or land management at scale, to a large part of the land in developing countries, both in the rural and urban areas. This gap is affecting the sustainability of the planet and its cities, forests and food production, among other things. Early work is being done to fill this gap by the land industry and this work should increase its market share and have a major impact on the lives of the poor and the places they live in. The industry has taken up this challenge but still a lot more needs to be done and done much more quickly. Finally, the technical gap covered by STDM is in the critical path of the delivery of a number of the Millennium Development Goals namely, Goal 1 on food security, Goal 3 on the promotion of gender equality and the empowerment of women, and of course Goal 7 on ensuring environmental sustainability, including improving the lives of slum dwellers. Angel, S., Sheppard, S. C. and D. L. Civco, (2005) The Dynamics of Global Urban Expansion, Washington, D.C.: Transport and Urban Development Department, the World Bank. Barry, M. and C. Fourie, (2002) Wicked problems, Soft systems and Cadastral systems in Periods of Uncertainty, Survey Review, 36(285):483:496, Paper presented at CONSAS, Cape Town, South Africa, 12-14th March, 2001. Bruce, J. and S. Migot-Adholla, (eds.) (1993) Searching for tenure security in sub-Saharan Africa, Kendall/Hunt, Dubuque, Iowa. Cowie, T. (1999) The development of a local land records system for informal settlements in the Greater Edendale Area, MSc thesis, University of Natal. Dorner, P. (1992) Latin American Land Reforms in Theory and Practice: A Retrospective Analysis, University of Wisconsin Press. Fourie, C., P. van der Molen and R.Groot (2002) Land management, land administration and geo-spatial data: Exploring the conceptual linkages in the developing world, Geomatica, 56(4). Fourie, C. and O. Nino-Fluck, (2001) An Integrated geo-information system for decision-makers in Africa, Survey Review, 36. Jenkins, D.P., D.A.Scogings, H.Margeot, C.Fourie and P.Perkin, (1986) Investigation of the Emerging Patterns of Zulu Land Tenure and the Implications for the Establishment of Effective Land Information and Administrative Systems as a Base for Development. Project Report, H.S.R.C. Latu, T.S. (N.D.), Modeling a land information system for freehold and customary land tenure systems, Department of Land Information, RMIT Centre for Remote Sensing and GIS, Occasional Paper Series, No. 95/1. Subtitle: A Pro Poor Land Rights Recording System, GIM. Mighot-Adholla, S., Hazell, P., Blarel, B. and F.Place, (1991) Indigenous land rights systems in sub-Saharan Africa: A constraint on Productivity? The World Bank, Economic Review, 5(1):155-175. Deininger, K., (2003) Land Policies for Growth and Poverty Reduction, World Bank and Oxford University Press. Moreno, E., (N.D) Living with Shelter Deprivations: Slums Dwellers in the World, City Monitoring Branch, UN-HABITAT. United Nations, (2007) The Millennium Development Goals Report 2007, New York, United Nations. United Nations Economic Commission for Africa, (1998) An integrated geo-information (GIS) with emphasis on cadastre and land information systems (LIS) for decision-makers in Africa. Background report of Expert Group Meeting, Addis Ababa, Ethiopia, 23-26 November, 1998. UN-HABITAT, (2008) Secure Land Rights for All, Nairobi, UN-HABITAT. UN-HABITAT, (2008) State of the World’s Cities 2008/9: Harmonious Cities, London, Earthscan. UN-HABITAT, (2006) State of the World’s Cities 2006/7: The Millennium Development Goals and Urban Sustainability, London. UN-HABITAT, (2003) Handbook on Best Practices, Security of Tenure and Access to Land, Nairobi, UN-HABITAT. Williamson, I., Enemark, S, Wallace, J. and A. Rajabifard (2009) Land Administration for Sustainable Development, Redlands, California, ESRI Press Academic. Clarissa Augustinus is Chief of the Land, Tenure and Property Administration Section, Shelter Branch, Global Division, in UN-HABITAT. Key driver of the Global Land Tool Network, focusing on innovative pro poor land tools. Network has over 40 international and regional partners, including multi-laterals such as the World Bank and FAO, bi-laterals such as Norway and Sweden the key funders, professional organizations, such as the International Federation of Surveyors, Commonwealth Association of Surveying and Land Economy, Federation des Geometres Francophone, Royal Institution of Chartered Surveyors, training and research institutions and international civil society. Previously Senior Lecturer, School of Civil Engineering, Surveying and Construction, University of KwaZulu-Natal, South Africa, focusing on Land Management. International consultant on land management and administration from an institutional perspective. Author of 3 chapters in books, and over 44 papers. Ph.D in Social Anthropology on customary and informal land tenure in an informal settlement in Africa.